In this year the Ministry introduced the new policy of collaborating with international curators, and the first one invited to undertake the assignment was British Henry Meyric Hughes. Hughes chose a proposal by Athens-based Nicos Charalambidis, one of the four artists to represent Cyprus back in 1997. Charalambidis proposed a complex installation under the general title La Casa Curva. This was an imaginary edifice taking the form of installations, collages, or virtual environments inside the pavilion, constructed on surreal political, social and historical narratives that represented an exercise of criticism on the ethics of leaders and contemporary societies. Their main component was activism, seeking to bridge the distance between the ‘utopian’ world of art and the actual problems occupying societies today. A chief example of these fictional zones of action was the Rumbling Museum – a simulated, prophetic arc where world-wide crises could be submitted to the logic of negotiation, thus avoiding force and military clashes; in the same idealistic spirit, the artist had important citizens and famous artists “exercise” in what he called the Social Gym, in order to devise solutions to political stalemates. Thus, the fantastical world of Art could become enriched with innate mechanisms of resistance against violence, serving the social vision of the artist and of all those who could actively embrace it. This was yet another project typical of Charalambidis’ style of fusing the personal with the political, against chaotic narrative figurations. Since the beginning of his career in the mid 80’s, his artistic preoccupations have been inextricably linked to the Cyprus problem, constituting a recurrent theme addressed through allegorical, unconventional and demythologising discourses. 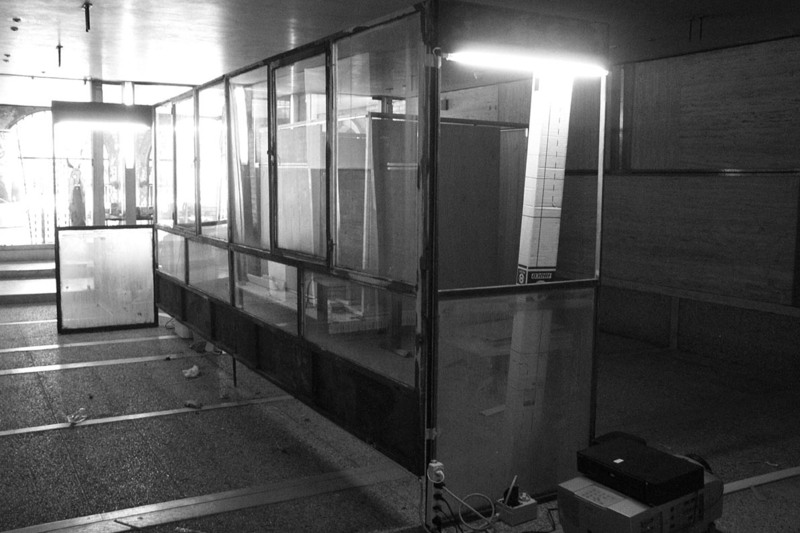 Similarly, the Venice project was filled with references to the Green Line and the ‘wall’ dividing the two Cypriot Communities, including a documentation of the symbolic process of detaching and transporting to Venice the glass wall of his Athens apartment. Following preview, part of the technical equipment was stolen, and later on, during the acqua alta period, one of the rooms flooded causing damage to some of the prints and installations. The installation presented here is yet another adaptation blending themes from the original Venice project. Nikos Charalambidis, Installation View, La Casa Curva, 2003. Nikos Charalambidis (b.1967, Limassol) lives and works in Athens. He studied painting at the Academy of Fine Arts in Florence and continued his studies in sculpture at the Athens School of Fine Arts. He completed his postgraduate studies in Digital Art, and obtained a Master’s degree in Robotics. He has realised over fifteen one-man shows in Greece and other countries and participated in several international exhibitions, festivals, conferences and biennials. Charalambidis represented Cyprus at the 50th Venice Biennale of Art, as well as the 47th Venice Biennale of Art together with three other Cypriot artists. Curator and writer, based in London. Hon President, the International Association of Art Critics (AICA), Paris and General Co-ordinator of Council of Europe Exhibitions. Founding International Board member of Manifesta: European Biennial of Contemporary Art and first President of the International Foundation Manifesta, Amsterdam (1996-2007).